Modi announced as BJP PM candidate : Modi rocked Advani Shocked ! Hindu nationalist Narendra Modi was crowned as the candidate for prime minister of India’s main opposition Bharatiya Janata Party (BJP) on Friday, cementing the remarkable rise of a leader adored by business but tainted by deadly religious riots that broke out on his watch. On a path that from humble roots as the son of a tea-shop owner to running for leadership of the world’s biggest democracy, Modi has methodically built a fervent fan base. But, a deeply polarising figure, he has made many enemies along the way, even within his BJP. Supporters believe he has the drive needed to salvage a sagging economy and make India a regional superpower. Detractors see an authoritarian extremist who could fan sectarian tension in the religiously diverse nation. India is due to hold its largest-ever general election within eight months. Modi’s elevation means the poll will pit the business-friendly chief minister of Gujarat state against the centre-left Congress party, which critics say looks jaded after a decade at the head of a fractious ruling coalition. 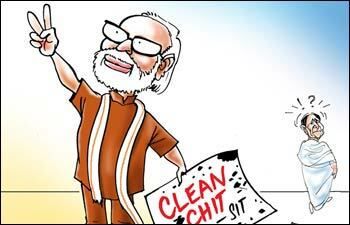 Modi’s success at chaperoning Gujarat’s economic growth was for years overshadowed by religious riots just months after he took office in 2002. At least 1,000 people died in the violence, most of them Muslims at the hands of Hindu mobs. A crowd of jubilant Modi supporters gathered outside the BJP’s headquarters in New Delhi ahead of the formal decision to name him the party’s candidate for prime minister, dancing, setting off firecrackers and handing out sweets. BJP president Rajnath Singh made the announcement in a brief statement to journalists. “I will work hard to achieve victory for the BJP in 2014 elections,” Modi said afterwards, describing himself as a “small party worker” from a small town. Modi, anointed as candidate just days before his 63rd birthday is known for rousing speeches and biting attacks on the Nehru-Gandhi dynasty that leads the Congress party. The government’s final years have been tarnished by graft scandals and the poor performance of Asia’s third-largest economy. Modi’s main opponent may be Rahul Gandhi, an establishment insider who represents the fourth generation of a dynasty that has governed India for more than two-thirds of the 66 years since independence from Britain in 1947. Gandhi’s late father, grandmother and great-grandfather were all prime ministers. By comparison, Modi is a self-made success who has presided over a decade of double-digit growth in Gujarat, bolstering a thriving manufacturing sector and earning a reputation as efficient administrator who speaks the language of business. Gandhi sought to diminish Modi’s achievements at a rally this week, contrasting the Congress party’s welfare programmes for farmers and the poor with Modi’s business focus. “The opposition says that infrastructure of roads, airports, bridges is needed to take the country forward. These alone can’t take the country ahead unless those who work to make these are taken care of too,” Gandhi said. “The Indian stock market’s greatest hope … is the emergence of Gujarat Chief Minister Narendra Modi as the BJP’s prime ministerial candidate,” Christopher Wood, chief equity strategist at CLSA Asia Pacific Markets told the Economic Times newspaper this week. An opinion poll published last week found that three-quarters of Indian business leaders believe the government of 80-year-old Prime Minister Manmohan Singh has mismanaged the economy and they want Modi to lead the country. Modi’s star appeal convinced the BJP to anoint him well ahead of the election. But his rise came only after a power struggle in the party. Other leaders’ ambitions were crushed by Modi’s sharp elbows, while others in the party worry that he is a divisive figure who will make it harder to form a coalition government. “A socially polarising leader has polarised his own party. Can he run a smooth, stable and effective government at the Centre? Think seriously!” Sudheendra Kulkarni, a close aide of Modi’s main opponent in the BJP, posted on Twitter on Thursday. Opinion polls consistently rank Modi as the favourite potential candidate for prime minister, but the complexity of India’s political equations and a first-past-the-post system mean victory is by no means assured. The party has little support in several important states and its Hindu nationalist philosophy is a turn-off for many Indians, especially among non-Hindu minorities – limiting Modi’s appeal to potential allies who rely on those voters. And while the Congress and the BJP remain the country’s two largest parties, the rise of regional political movements mean both will have to woo smaller parties to win the 272 seats needed to form a coalition government. Human rights groups and political rivals have long alleged that Modi allowed or even actively encouraged the 2002 attacks on Muslims in his state. Modi has always vehemently denied the accusation, and a Supreme Court inquiry found no evidence to prosecute him. After the riots, the European Union shunned Modi and the United States denied him a travel visa. But as he has grown in political importance, foreign envoys have begun to cautiously woo him, helping his political rehabilitation at home. Opponents still accuse the BJP of playing on religious tension to consolidate the Hindu vote, most recently after a spasm of religious violence in Uttar Pradesh that killed at least 37 people.